Julien Morel of the Swedish Energy Agency (‘Energymyndigheten’) has pointed me to the newly released Swedish Energy Balance for 2014. This one is interesting, as it is set up mirrored, to be read from right to left, in contrast to the common way of presenting national energy flows (e.g. here for Australia or here for Iran). Overall consumption was 368 TWh in 2014. Sweden relies roughly one third on nuclear energy, one third on fossil fuels, and one third on renewables (wind, hydro and biofuels). 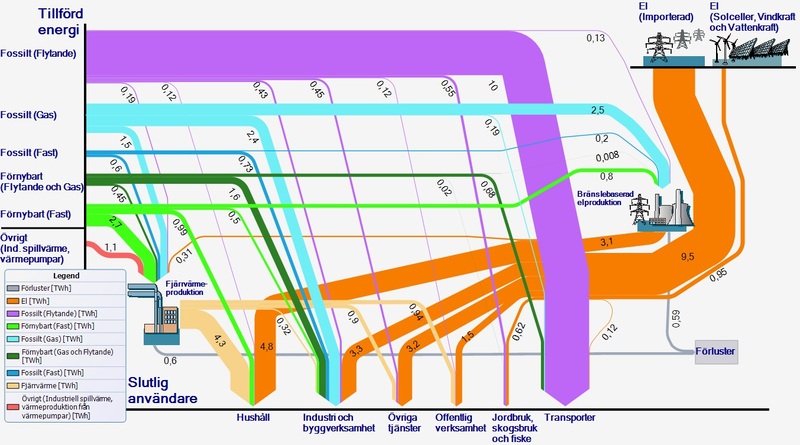 The different areas of the energy system are further detailed per consuming sector and per fuel type and shown with individual Sankey diagrams. So if you understand some Swedish, go check out the 17-page presentation. Unit of flows is TWh. 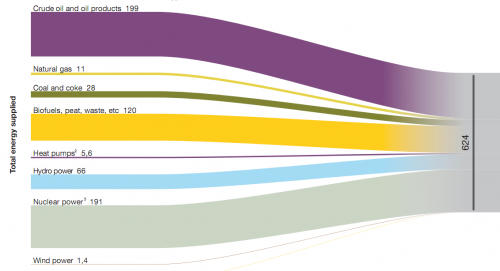 The orange arrows are imports, the other arrows from the left apparently domestic production, with the majority of energy being from fossil fuels (“Fossilt”). Consuming sectors are at the bottom – in contrast to the typical layout of this kind of energy balance diagrams. Anyone from Sweden who wishes to comment and explain a little bit? 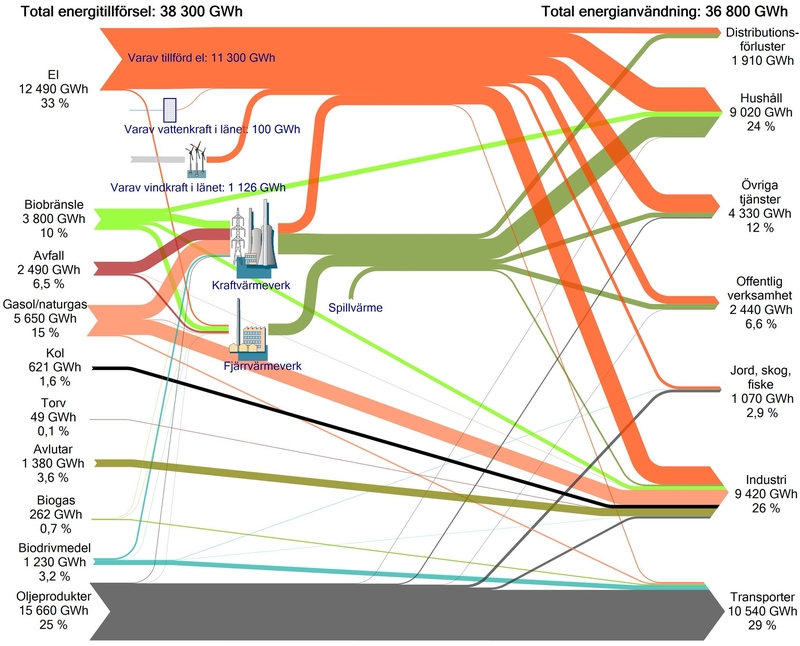 Below are three image sections of a Sankey diagram showing Swedish energy flows in 2007. These were published on p. 54/55 in the report ‘Energy in Sweden 2008’ by Swedish Energy Agency (Energimyndigheten). Numbers are in TWh, source for the diagram was Statistics Sweden data. 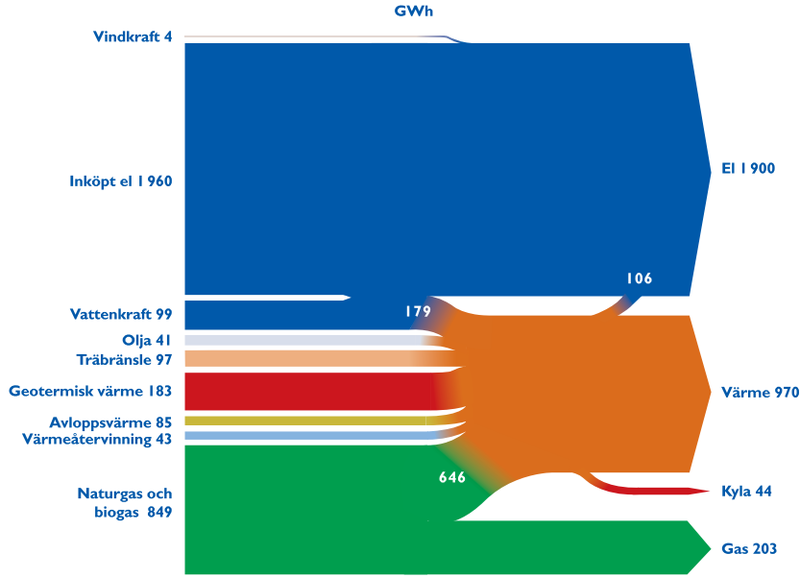 The first diagram (which is the left part of the diagram) shows the total 624 TWh energy supplied and the energy sources. 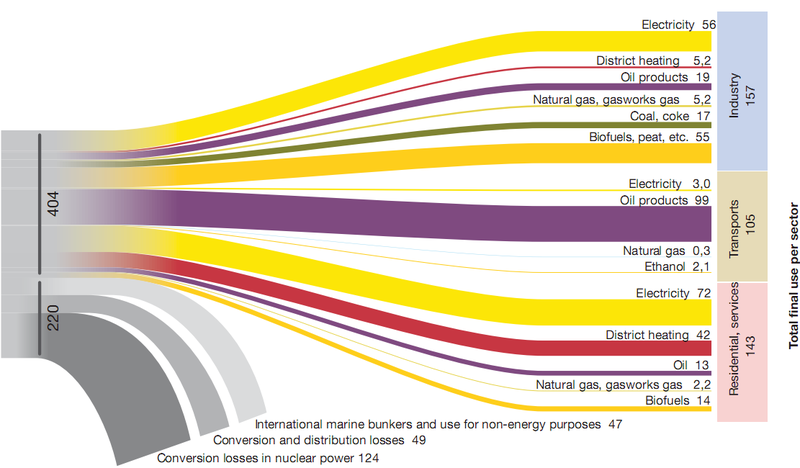 The second one is the breakdown of energy produced by sectors, and also shows the losses in energy conversion. The third on is a different breakdown of the 404 TWh by energy carrier. Nothing more to add. They are simple, clean, beautiful. My Sankey diagram tour around the Baltic Sea continues. After stops in Estonia and Poland, today it is Sweden. 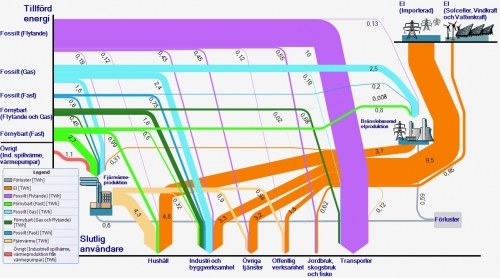 The diagram below is from the website of the energy provider of the Swedish city Lund. This diagram is in GWh. It shows the different energy sources used in Lund on the left side, like wind energy (“Vindkraft”, 4 GWh) or geothermal energy (“Geotermisk värme”, 183 GWh). The largest portion (1960 GWh) is electrical energy purchased. The arrows on the right hand side show as what type the energy is being consumed: electricity, heat, cold and gas. I like this diagram for its ‘blockish style” and the very strict horizontal orientation. The fact that certain flow quantities are branching off to join other arrows is indeed rather difficult to depict. You can see – especially on a b/w printout of the PDF file (on their old website) – that they were struggling with this, but they smoothed it nicely with color gradient effects. If you take out your pocket calculator (and that’s what I always do! ), you will come up with a difference of 244 GWh (“inputs” on the left 3361 GWh, “outputs” on the right 3117 GWh). Might this be attributed to transformation losses?